Brush 9-inch-diameter spring form pan with margarine; line bottom with parchment. Stir 1 2/3 cups chocolate chips and 3/4 cup margarine in medium saucepan over low heat until smooth. Whisk in cocoa and espresso. Cool 10 minutes. Using electric mixer, beat eggs and sugar in large bowl on high speed until thick, about 6 minutes. Bake torte until dry and cracked on top and tester inserted into center comes out with some moist batter attached, about 42 minutes. Cool in pan on rack for about an 1 hour (center will fall). Using spatula, press raised edges so top is level. Cut around pan sides to loosen torte and remove sides. Place plate atop torte and invert onto plate. Remove pan bottom; peel off paper, and cool torte completely. Stir remaining 1 cup (6 ounces) chocolate and 1/4 cup margarine in small saucepan over low heat until smooth (do not overheat). Cool glaze 15 minutes and pour into center of torte. Smooth top with spatula, allowing some of glaze to drip down sides. Garnish with mind and blackberries (or any berry of choice). I decorated this with fresh raspberries around the outside (see second picture). 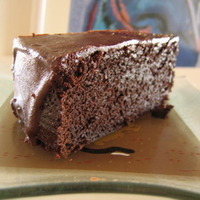 It was beautiful and the raspberries added a nice tartness to this very rich chocolate cake. This is delicious! Not quite as rich as the chocolate gateau by Ali, but still delicious. I liked it with the fresh raspberries on top! it seems slightly more difficult than id want it to. is it hard to make?